January is a difficult time to find local flowers, but succulents are readily available this time of year! 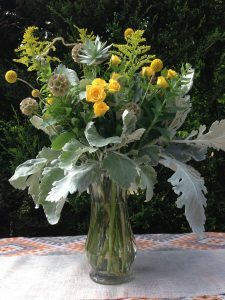 They make a great, hardy addition to bouquets and arrangements, and they are fun to work with. 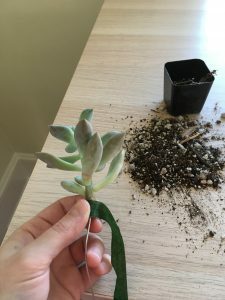 In this tutorial, I wanted to show you how to get succulents ready for design work. 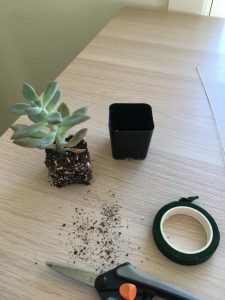 To start, you will need a succulent, a floral wire, some snips, and floral tape. 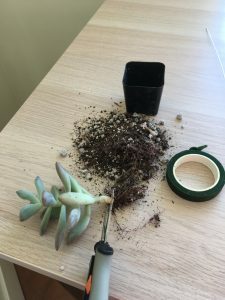 Remove the succulent from the container. Loosen as much dirt as you can, and pull off the roots gently. You will still have some roots attached at the very base. 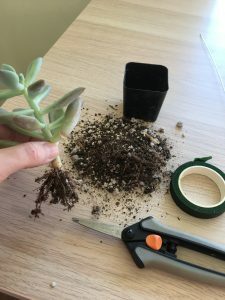 Snip the stem of the succulent as close to the root mass as possible. 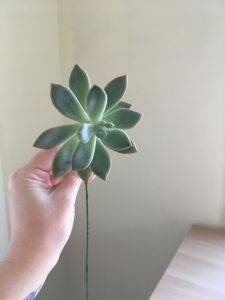 You want enough stem length to hold the succulent, but without roots and dirt attached. Hold the succulent and grab your wire. 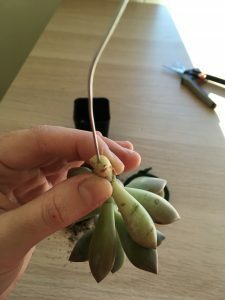 Insert the wire into the stem of the succulent, pushing as straight up the stem as you can. Make sure you press firmly on the stem as you push the wire–sometimes they like to exit on the side, which is no good. 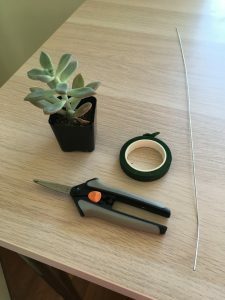 Test your wire by making sure your succulent can withstand some movement. After you are happy with the wire insertion, grab your floral tape. 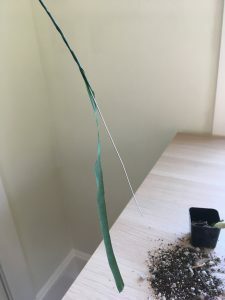 Floral tape is used to hide the wire and blend it in with the other (green) stems. 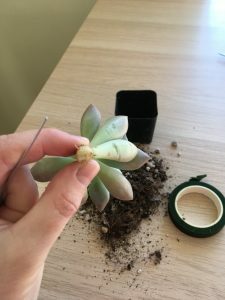 Start at the base of the succulent and wind the tape down tightly. Make sure you pull the tape so that it sticks. Continue winding the tape down to the end of your wire. When you are done and all silver bits are hidden, trim the tape and press it to seal the end. Finally, you are ready to use your succulent in an arrangement like this one! 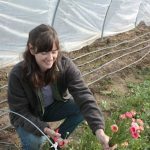 You can easily cut your wire stems to achieve the right length. 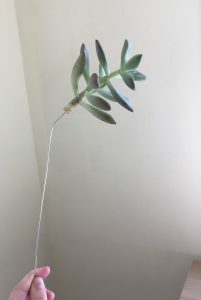 Also, once the other flowers have faded, you can remove your succulents from the wires and plant them! We are always working to deliver content that is useful. 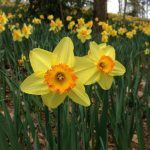 If you liked this post, please leave a comment! Awesome guide! I’ve always loved succulents in bouquets.